Free entry. Payment for games competition. Part One: Opening ceremony and performances (choir, Korean traditional dance, saxophone), lunch time. The menu: tteokguk (rice cake soup). 1) Team event: three members per team. Yoot-no-ri (Korean board game). 2) Individual events: Jae-ki-cha-gi, Jang-ki (Korean chess), Tou-ho game etc. 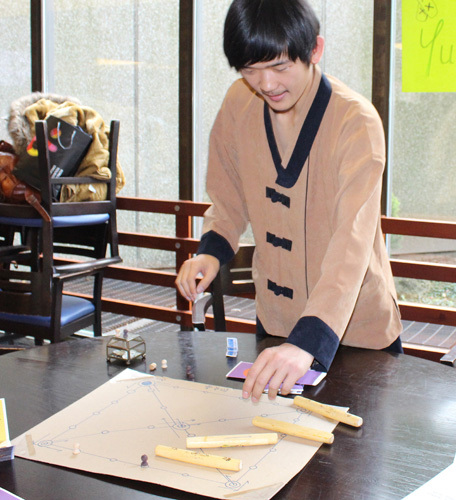 Yoot No-ri Board Game.Copyright ©2014 Ruth Lor Malloy.